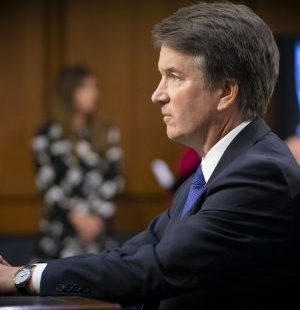 WASHINGTON – President Donald Trump’s Supreme Court pick, Judge Brett Kavanaugh, stressed the importance of judicial independence amid sporadic interruption from protesters during the second day of his confirmation hearing. Kavanaugh, 53, made the statement in response to a question from Chairman Chuck Grassley (R-Iowa). While Kavanaugh spoke, protesters shouted political sentiments before being removed from the hearing room by U.S. Capitol Police. Protesters also interrupted Tuesday’s hearings. The sentiments likely are related to concern about a 2009 Minnesota Law Review article in which Kavanaugh wrote that sitting presidents should not be subject to criminal proceedings or investigations. Democrats allege Trump nominated Kavanaugh to help insulate himself from Special Counsel Robert S. Mueller III’s investigation into potential collusion between members of the Trump campaign and Russian officials should a case ever come before the high court. Kavanaugh dismissed suggestions that he would insulate Trump from potential legal culpability. “No one is above the law in our constitutional system,” he said. Kavanaugh cited his concurrence with the 1973 Supreme Court decision United States v. Nixon as an example of his views on the limits of executive power. Kavanaugh called the case “one of the greatest moments in judicial history.” In the case, the high court unanimously ruled that President Richard Nixon had to turn over tapes he recorded of conversations with aides. Kavanaugh refused to answer a question from Ranking Member Dianne Feinstein (D-Calif.) as to whether a sitting president could be force to comply with a subpoena to testify before a grand jury in a criminal case. Kavanaugh said he did not feel it was appropriate to respond to questions about “hypothetical” situations. Kavanaugh reiterated his belief in judicial independence when Republican Sen. Orrin Hatch of Utah asked if he would shield Trump from potential legal culpability. “Senator, I’m an independent judge,” he said. Kavanaugh said he would not feel indebted to Trump for having appointing him to the high court. “If confirmed to the Supreme Court and as a sitting judge, I owe my loyalty to the Constitution,” Kavanaugh said. Kavanaugh refused to answer a question from Democratic Sen. Patrick Leahy of Vermont as to whether Trump is able to pardon himself. “It is a question therefore that is a hypothetical question that I can’t begin to answer in this context as a sitting judge and as a nominee to the Supreme Court,” Kavanaugh said. “I hope for the sake of the country that remains a hypothetical question,” Leahy replied.